My impression of this movie is that in many respects, it got out of hand. The intent was to deliver a realistic example of what traveling on the Titanic would have been like, but the detail got out of hand. Also it’s impossible to get people to sit in the theater for over three hours of beauty passes over grand staircases, so a generic love story had to be dropped in, which also got out of hand. Finally, Neil Degrasse Tyson got out of hand. I have a lot of respect for the docent astrophysicist, but even though I’ve heard the argument for fixing the sky to have accurate stars several times, I don’t buy it. Yes, there was a lot of detail lavished on the ship and costumes that would go overlooked by most people, but that detail has a lot more chance to impart valuable information about the setting than the positions of points of light in the sky. I like to be complete, but there’s a point where returns on detail diminish. Nobody was looking at the stars before Tyson complained. Rose Dewitt Bukater and her fiance Cal depart on the Titanic, and Jack Dawson wins third-class tickets at the last minute. Rose is far more independent and educated than a woman is expected to be at the time, and has just realized that the life her mother and fiance have planned for her is entirely too restrictive for her, and intends to jump into the propeller blades, but Jack talks her to safety. They quickly fall in love, even though Rose’s mother and Cal forbid her to continue speaking to Jack. Rose and Jack plan to disappear from Cal’s reach, but then the iceberg hits and historical pandemonium breaks out. While the story doesn’t dwarf the setting as much as I thought (the last hour or so is strictly the world’s most meticulously-detailed disaster movie), if the point is the experience of the Titanic’s disastrous voyage, a better approach would probably be to have a more ensemble focus, either as a miniseries (which exists) or perhaps a whodunnit mystery, like Murder on the Orient Express. Altogether, I’d say the film is about half love story and half “You Are There: Titanic”. At three and a quarter hours, it has time to be both adequately, but I felt the sinking sequence dragged a bit. Now they’re separated. Now they’re together. Now they’re on deck. Now they’re locked below. Now they’re up top again. For the better part of an hour. This is the kind of movie I’d love to be involved with making, as long as I didn’t have to worry about the logistics. It’s a testament to what we can capture on film, but not every movie that costs more than the item it’s based on can make a profit. This is a good argument for making expensive movies, but they can’t be expected to be the lifeblood of the industry. Still, it doesn’t quite measure up in places. Nobody can fault the CG on being too cheap, but it still looks slightly dated. Also being so committed to historical accuracy is an invitation for viewers to nitpick more closely. Just because a story is generic doesn’t mean it’s bad or irrelevant. 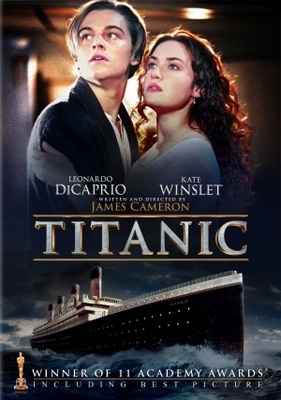 The story of Jack and Rose is responsible for the movie’s success, because it’s told well, even if it is “Romeo and Juliet on the Titanic”. It’s told so well that fifteen years later, people are still arguing about whether the end of their story would have had to work out like that. I was more interested in the story going on with the Captain and the crew, but I was far from disinterested in the leads. The love theme of the score was beautiful, especially on Celtic flute, but the pop version sung by Celine Dion likely didn’t ruin it so much by existing as by being overplayed when it first came out. Watch this movie: near, far, wherever you are, the profits will go on. Don’t watch this movie: as just something to fill time. Love to see you compare this to Poseidon Adventure.